The rain didn’t stop camera crews, photographers or residents from attending the inauguration of A’Shop and Prevention NDG’s collaboration mural of “La Notre-Dame-de-GrÃ¢ce/Our Lady of Grace” on Tuesday afternoon.At 10:30 am, people were already huddled under the eaves of the Couche-Tard on the corner of Sherbrooke Street and Madison Avenue in front of a City of Montreal plexiglass podium for the ceremony. Roughly 85 people showed up to hear CÃ´te-des-Neigesâ€”Notre-Dame-de-GrÃ¢ce borough mayor Michael Applebaum, city councillors Richard Deschamps and Susan Clarke, Terri Ste. Marie, director of Prevention NDG, and graffiti artist Fluke, who spoke on behalf of A’Shop, a Montreal artist-run collective with a focus on graffiti culture. The mural was created using some 400 aerosol spray paint cans rather than paint brushes, and stands six stories tall. It depicts the agricultural roots of NDG as well as points of interest in the city, including Saint-Joseph’s oratory, the two metro stations and the Orange Julep. 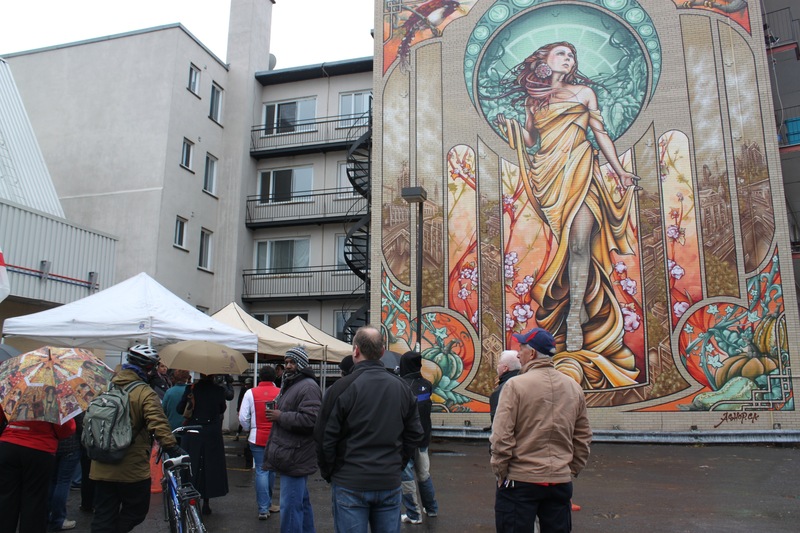 Inspired by the work of 19th century Art Nouveau Czech artist, Alphonse Mucha, the mural was created by A’Shop artists Fluke, Antonain Lambert, Dodo and Bruno Rathbone in collaboration with Prevention NDG’s Guillaume Lapointe.